Oh, yes, yes I do… like big books, art therapy and counseling tomes (including books about expressive arts therapies and indigenous and ancient healing traditions) and I cannot lie. One of the best things about the Southwestern College M.A. in Art Therapy/Counseling program is the diverse art therapy and counseling books required reading list. Each course has both required and recommended reading and I admit that they are keepers. It’s not just that these books are educational and “consciousness-raising,” (yes, threw that old-school terminology in to see if you were really awake). Surely, you will transform your consciousness by reading these books but, primarily, these books are life-changing, inspired reading (if this program and school are right for you), and many provide an education in cutting-edge therapeutic facilitation tools and techniques. These books are those that you can’t wait to pick back up and will want to buy (if you’ve rented or borrowed them instead of purchasing). I repeatedly find myself (after departing a class lecture… or post cat-stretch upon reading for hours) calling a close friend to share about what I’m reading for class credit. My best friend is always seriously jealous, a shockingly massive percentage of the books I’ve been reading are on his “to read” list. I don’t gloat, yet I do find myself repeatedly reminding him that he could apply and be reading these books for credit as early as the coming next term (rolling admissions mean you can enter in the fall, winter, spring or summer sessions). In reading the books on the curriculum, I’m learning facilitation techniques, how the consciousness of humanity has evolved and is evolving, about co-dependence based in developmental issues (issues of childhood attachment), the neurobiology of healthy childhood attachment, archetypal psychology, Jungian concepts, Person-Centered therapy, psychoanalysis, and so, so much more which increases the chance of my becoming one of Southwestern College’s many success stories. Did you know the Quimby Memorial Library, Southwestern College’s campus library, between several collections, has in excess of 20,000 psychology/counseling books (big and otherwise, not including CDs and DVDs)? 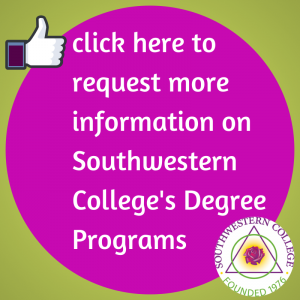 If you like big (art therapy and/or counseling) books, and want to combine your loves of psychology and art, and have a soul calling to the helping professions of art therapy and/or counseling, click the image to request your Southwestern College information pack. Hope we’ll see you on campus soon!